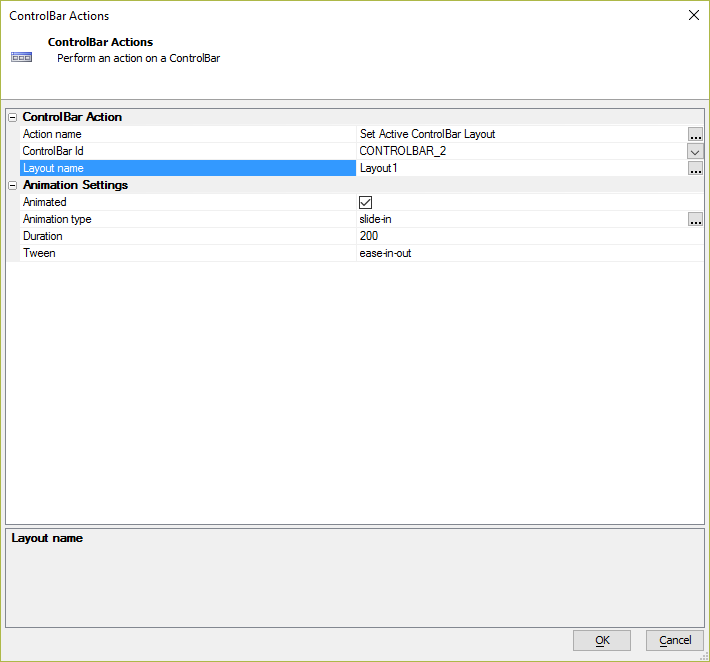 Performs an action on a ControlBar, such as setting the active Layout or refreshing the ControlBar. If a ControlBar defines multiple Layouts, select the Active Layout. If a ControlBar has a 'data' object, update one or more properties in the ControlBar's 'data' object and then refresh the ControlBar. Opens a Disclosure defined in the ControlBar. Hides the currently open Disclosure. 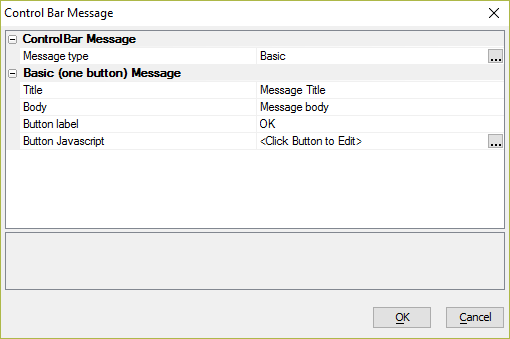 Display a message that has been imported using the 'Messaging Functions'. 'Messaging Functions' can be imported into the ControlBar using the hyperlink on the 'Home' tab in the ControlBar builder. Specify the ControlBar you want to perform an action on. Opens the Control Bar Message dialog for configuring the type of message to display. A Basic, Confirmation, or Wait message can be shown. Opens the Disclosure Genie for configuring how a disclosure should be shown. The ControlBar layout to display. Enter a cr-lf delimited list of the ControlBar data items you want to update. The 'data' variable to update. Specify if the onChange event should fire. Whether or not to delay the refresh of the ControlBar. This is useful if other code may also refresh the ControlBar and it is desirable to only have one refresh occur. Specify if the ControlBar action should be animated. Defines how intermediate states of the animation transition are calculated. Specify if the disclosure should be animated when it is hidden. If checked, the same animation that was used to show the disclosure is used. The Disclosure Genie is used to define the Show Disclosure settings for displaying a Disclosure for the ControlBar. Specify the name of the disclosure to show. You can also show a named Layout as a disclosure. Specify the disclosure size. Enter an explicit size using CSS syntax or specify 'none' (to use a default size) or 'fill' (to fill the available space for the disclosure). Specify if the disclosure should be shown with animation. (Optional) Specify the animation duration in milliseconds. If you leave this blank, the default duration is used. (Optional) Specify the animation tween setting. If you leave this blank, the default tween is used. Specify if the disclosure should be closed automatically when the user clicks/taps off the disclosure. 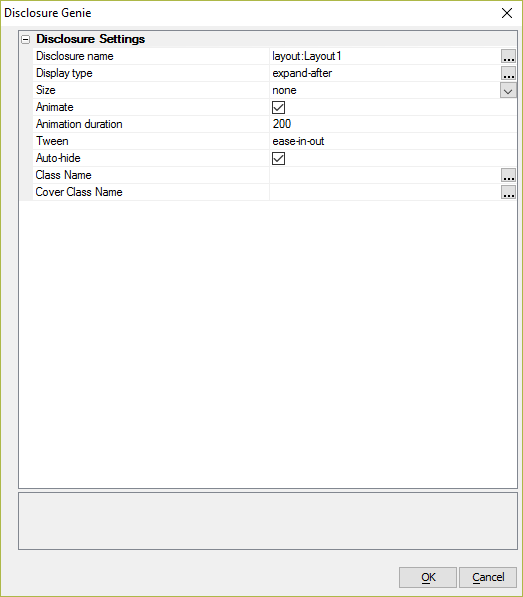 Optional override to the class name to place on the disclosure element. Optional override to the class name to place on the element that covers the screen when the disclosure is shown. If explicit is chosen for the Display Type, you must define an explicit clipping rectangle. The clipping rectangle is an object with the following properties: left, right, top, and bottom. These properties define the relative distance to the edge of the screen in pixels. In addition to defining left, right, top, and bottom, you must also specify the edge within the clipping rectangle from which the disclosure will be shown and the fill. Distance from the left edge of the screen in pixels. Distance from the right edge of the screen in pixels. Distance from the top edge of the screen in pixels. Distance from the bottom edge of the screen in pixels. The edge from which the disclosure is shown from within the clipping rectangle. Choices include top, bottom, left, right. The fill . Choices include width, height, both. The Control Bar Message dialog is used to configure a popup message shown for the selected ControlBar. In order to display messages for a ControlBar, you must import the 'Messaging Functions' in the ControlBar. 'Messaging Functions' can be imported using the link on the 'Home' tab in the ControlBar builder. The length of time to wait, in milliseconds, before the wait message is automatically closed. The title for the popup message. The message to display in the confirmation message. The text to display in the OK button. The text to display in the Cancel button.